At this time the avenues mention ed were north/south bound. 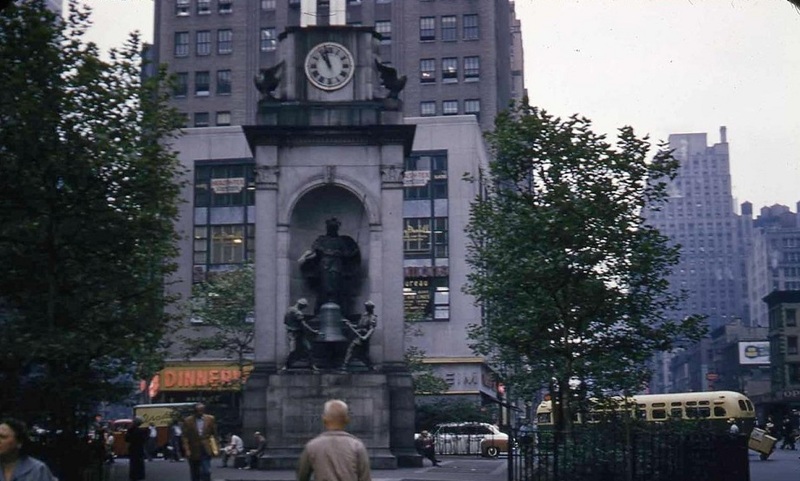 After the 1957 one-way conversions of Sixth Avenue north of Herald Square and of Broadway from Columbus Circle to Herald Square, southbound 6 and 7 buses would transition from Broadway to Sixth at 34th - and then turn east on 30th Street towards Broadway. B.T.W., in that building, on the first floor, now stands a Santander Bank branch. The photo is dated 1952. At what point would the simple green/cream paint scheme that bus displayed, have first shown up on NYC Omnibus rolling stock? I presume this was one of the later of the 4509's? Also, as of '52, I seem to recall southbound Broadway buses turned east on 36th Street to Sixth, as both throroughfares were totally partitioned down the middle during that period. The simple green and cream paint scheme came to New York City Omnibus with the arrival of the GM TDH-4509s. This was due to increase in labor cost. However, the TDH-4509s that were ordered for Fifth Avenue Coach, which came in the middle of the New York City Omnibus order, arrived in the streamline color scheme. Some of the earlier buses in the NYCO fleet were painted in the simple green and cream scheme sometime in the 1950s. The simple green and cream colors came to Fifth Avenue Coach when they ordered the GM TDH-5104s.